Gorilla coat hanger sculpture – ¿¡ tjongolongo ?! Yep, I found another strangely made sculpture. 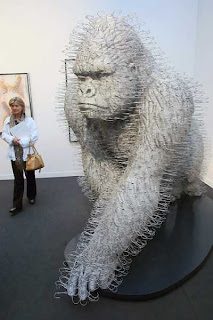 This time it’s a Gorilla statue made out of hundreds of recycled coat hangers that made me go tjongolongo! The sculpture was made by artist David Mach. The Gorilla wasn’t the only sculpture made by the artist, he also created an Astronaut and a couple of other statues. I really like the gorilla though! I’m always amazed by what people can make out of disposable material. I know that I’ve said it before, but sculptures and creations like this always make me urge communications departments to take a look at how they can use these artists creativity into their campaigns etc. Seeing things like this should just make people feel creative, even if it’s just for a second! What material would you like to see artists use to create sculptures?